Fans of Canon’s successful EOS 7D model have had to wait five long years for a replacement to the brand’s top-of-the-line APS-C D-SLR. The successor, named the 7D MkII, sees a number of improvements that will appeal to the camera’s core audience – enthusiast sport and wildlife photographers. The original 7D broke new ground by delivering a combination of a high pixel count (18Mp) and a fast frame rate (8fps) in a sensibly-priced enthusiast-level APS-C camera. The latest offering builds on these foundations but moves the 7D line closer to the professional-level 1D series by introducing technology found on Canon’s full-frame flagship 1D X model. With lots of specifications to work through, let’s drill a little deeper to see if the MkII really has been worth the wait. At a quick glance, users may not notice too many physical changes from the original 7D, but they’re certainly there. Built with a strong magnesium alloy body, the 7D MkII is second only in weather proofing to the 1D X, which means it can easily withstand a few minutes in a typical UK rain shower. The shutter is rated to 200,000 actuations and although the MkII accepts the same battery as the original 7D (and the 6D), the body comes with a higher capacity version capable of 670 shots between charges – although I managed to shoot more than this figure during our field tests. The replacement body weighs over 100g more than the original 7D, but the MkII does include a GPS unit and dual DIGIC 6 processing units. It’s these, which pack more processing power than is found in the 1D X, that are key to the D-SLR’s two headline features. The MkII can now fire off a rapid 10 frames-per-second and boasts a cutting edge autofocus system with 65 focus points, all of which are the more sensitive cross-type points. That’s a leap from 19 AF points on the original 7D, and actually exceeds the 1D X’s 61 AF points. The advanced AF system, which includes Canon’s iTR AF tracking system, uses colour and face information to recognise, lock-on to and track moving subjects as they travel around the frame. Perhaps the dual DIGIC 6 processor’s best trick is to allow the camera to capture up to 31 RAW files in burst mode or over 1000 JPEGS – perfect when you need to capture a long action sequence. Speed is at the heart of this camera and this trickles down to the button layout. A new thumb lever is found on the rear of body, positioned around the joystick. It can be assigned to change Exposure Compensation, ISO or AE Lock and drastically speeds up the general operation of adjusting exposure settings. The 7D MKII sees a leap in ISO range, with 100-12,800 achievable in its native setting and up to 51,200 in the expanded mode. Images can be reviewed on the 3in, 1040K-dot resolution fixed LCD. Potential buyers scanning the spec list will notice that while the camera does have GPS, there is no Wi-Fi featured and the LCD doesn’t flip out or boast touchscreen technology. Videographers will be pleased to hear the MkII includes mic/headphone jacks, continuous phase-detection focus during filming and the ability to capture video at various frame rates, including 60p, which is preferred for slow or fast motion. 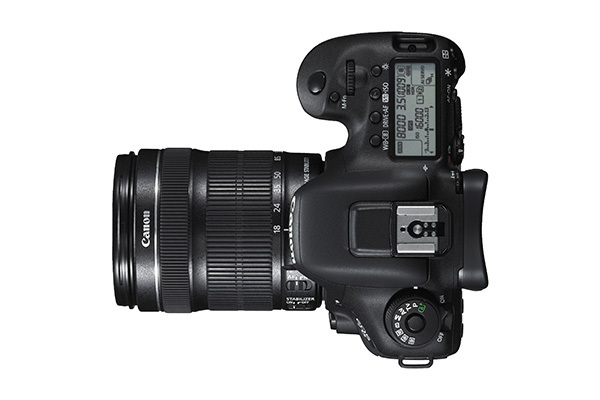 Previous Canon users will feel instantly at home when they pick up the 7D MkII. Although it’s heavier than both its predecessor and the full-frame 6D, the 7D MkII feels well balanced and comfortable in the hand. Apart from the addition of the thumb lever around the joystick on the rear of the camera, the button layout doesn’t show any great departure from Canon’s usual approach. That’s a good thing, because every button is logically thought out and makes for quick and efficient navigation around the body. Users can rate images in an instant by pressing the RATE button (once for one star, twice for two, and so on). Creative modes such as HDR, Multiple Exposure and the Intervalometer are accessed via the Picture Styles button and these small but speedy ergonomic tweaks quicken operation, which will appeal to serious enthusiasts and pro users. Like the button layout, the Menu system is familiar enough to navigate around but also incorporates useful additions not seen on the original 7D. There are more autofocus options, but if you don’t want to get lost in fine-tuning your AF, six presets are available, each tailored to a different type of motion. For example, one preset will force the AF to focus on new objects entering the scene, while another will ignore these and stay locked-on to a moving subject in the centre of the frame. These presets are a great way for those learning sport photography to increase their chances of capturing sharper action shots. In the field, the Canon performs flawlessly. Squeezing the shutter and firing off shot after shot is a joy – although with 10fps to play with, you’ll need to buy some more back-up drives to store all your photos! Although the jump from the 7D’s 8fps to the MkII’s 10 doesn’t seem that huge, in reality it can make the difference between getting that magic wildlife moment, or missing out. Furthermore, the enhanced weather protection gives users reassurance that they can wait that little bit longer when the rain starts to fall before needing to get the camera under a brolly or bag in the bag. The 7D MkII is the most expensive APS-C camera on the market, and pricey when compared to rivals like the Sony A77 II or the Pentax K-3. However, take into account the pro features the camera borrows from the EOS 1D X and the MkII suddenly seems like a great deal. At a shade under £1600, we’d like to have seen Wi-Fi to help with remote capture and operation, but with the pace and durability the MkII offers, it’s a sound investment for serious shooters. Given its price tag, the 7D MkII is likely to appeal more to existing Canon users than first-time D-SLR buyers. In this case, its pro-level features offer a lot to those looking to trade up to a dedicated sports and wildlife camera for enthusiast level money. It may also appeal to users of older 1D cameras who want to retain fast frame rates but can’t stretch the budget to a 1D X. The features that have been added like the advanced focusing system are substantial and perform well. Canon took its time to release the 7D MkII but the improvements that have been made will certainly tick the boxes original 7D users were after. More speed, more memory card slots, bigger resolution, better weather-proofing. Overall, it’s a very impressive camera. Expect to see it being used by both enthusiasts and professionals for many years to come!